As we all know, Easter comes on Sunday next, and celebrates one of the most solemn observances of the Christian calender: the Resurrection of Jesus. And as we should know, prior to being sent down the Via Dolorosa and given the full Mel Gibson treament, Jesus, as a decent, if Essene-influenced Jew, celebrated a passover seder with his Apostles, as is attested in the Synoptic Gospels. So we can be pretty sure that the Son of Man was feasting on lamb, as can be seen in the Renaissance painting above. That's definately a lamb head. Definately kosher for passover. (It's doubtful, however, that the pious Jews of Galilee would have allowed a dog into the seder, though.) The rememberance of the paschal lamb, as it comes to be known, is one of the strongest traditions linking modern Christian observance to the practice of the earliest Judeo-Christian Churches. (The determining of the date of Easter traditionally was based on Passover, lunar date Nisan 14, as can be read in the early Christian Paschal Canon of Anatolius of Alexandria.) And sure enough, most Easter traditions celebrate Easter with some version of a lamb dish. I mean, the Greeks go positively lamb crazy, breaking their strict observance of Lent with lamb roasts, lamb gut soup, lamb heads, lamb anything after fourty days of no meat. Hungary, however - forever attracted to the untested territory of dodgy Third Way programs - disdains mutton on Easter and goes straight for pork. Pork is probably the single most significant symbol of the celebration of Easter in Hungary. From the original sacrificial lamb symbolism of the Last Supper, we get the National Pig Fest. The week before Easter in Hungary means one thing: ham everywhere. Hungarians love to sit down to a gigantic porkfest on Easter Sunday, and the preparations spill out of the markets and into the streets during the days leading up. We are not talking about some sliced lunch meat here, nor some watery salty pink porky spam that comes out of a can. Hungarians eat a lot of that too, but on easter it is time to go for the real thing. Big Ham. Kilos of ham. Tables groaning with ham. Families pay big money for the best quality smoked hocks they can get. This is the final swine event for a country that possibly consumes more pork per capita than any other nation in the world (Although I believe the official pork consumption champions are the Czechs, but that may be a sampling mistake foisted by anti-Magyar pork cartels.) Depending on the size of your family gathering, a Hungarian Easter lunch can go through anywhere from a mere lot of pork to a whole side of pig - smoked, brined, boiled and baked - in a sitting. Feasts like this are not so much about quality as about quantity. The hams above are country smoked hams seen in the Bosznyák tér marketplace yesterday. These huge babies will get soaked for a day or two in a tub of water to release some salt and moisten up, and then be baked or boiled for the Sunday Swine-a-thon. One single ham would never be enough for an Easter lunch - you need an entire array of smoked and salted pig parts to mark the resurrection of Jesus. Above are the budget snack meats of the ham family waiting to be snatched up - csúlők, smoked pig knuckles, which are pretty affordable at most times, but are laughably cheap when delivered by the trainload to every shop in town all at once before Easter. Same deal: soak 'em, bake 'em. Eat 'em up. Repeat. Hristos Anesti and pass the pork! The newspapers are usually full of dark scandals involving the import of Slovak hams around this time of year, predictably because Slovakia has cheaper hams and with the EU borders now in place, anybody can import Slovak hams to their heart's delight. I have no problem with Slovak hams. As any Hungarian nationalist can tell you, these misplaced swine parts used to be Hungarian hams... in fact, they are still Hungarian hams in essence! Slovak ham, however, are pretty indistinguishable from the Magyar product, although I will admit that a good Slovak pig knuckle blows away the Hungarian version on any good day. But the question keeps coming back: why pork on Easter? I am not too sure that Art has the answer, but a visit to the Budapest Museum of Fine Arts a couple of weeks ago revealed a lot to me about the pig-for-pesach question. 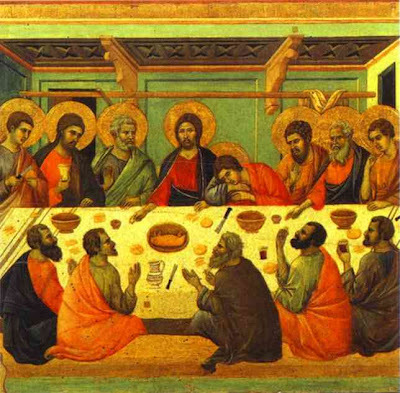 A lot of the medieval depictions of the last supper show Jesus sitting in front of his last meal... a pig in a basket, essentially. 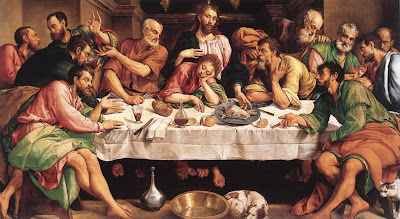 The Apostles all seem to be pointing at the main course, shocked and stunned, as if saying "Josh, man... you aren't actually thinking of eating that, are you? Oy vey!" Now, as a good Jewish leader and rabbi our Man would not have sat in the same room as a piece of chazzerei, let alone sit down to a seder with a piggy plate of treyf as its centerpiece. But most Medieval Europeans wouldn't have known that. And most modern Europeans, at least in this part of the world, would not know that either. They would prefer to believe that the Son of Man, King of the Jews, the point Man of the Holy Trinity would have eaten things that they themselves like to eat. 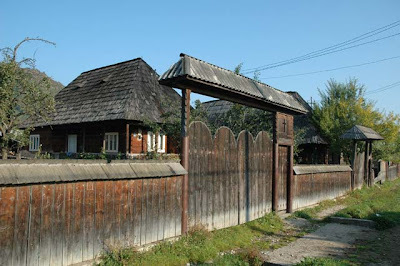 (Be thankful that Mickey D's only came to Hungary in the 1980s... Give us this day our daily Big Mac, and supersize it!) And so, like a kid in a spiritual candy store, Magyars chow down on their favorite oinking snack every spring as Lent becomes a memory, and the ham trucks head home to Slovakia until another year. As Anthony Bourdain's unfotunate encounter with Romanian public opinion fades into the vaugue white noise of the blogosphere, we have to ask: if Bourdain came to Hungary, would things be all that different? Probably not. Last week my parents were in Budapest, causing me to go out to a lot of restaurants I would never normally approach with a ten foot pole. Legit eateries, ones that have table cloths and snooty waiters. And guess what? I was appalled - at the food, at the prices, at the service. I live here, but we tend to eat at home or in small étkezde lunch shops outside of the downtown, so it has been a while since I got to see for myself how mediocre the restaurant scene for traditional Hungarian food has become in Budapest. 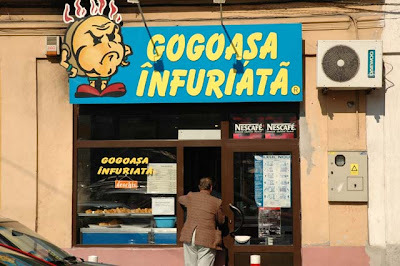 And most of all: you can not find a decent bowl of gulyás in the Hungarian capitol city. Of course, Bourdain would have been looking for a decent bowl of "goulash" and I am sure his minders would have alerted the chefs at the top Ministry of Tourism-preffered resturants in advance to cook up a batch of the real stuff, not the crap they serve tourists in little table sized kettles designed to evoke the huge bogrács kettles used to make legitimate gulyás out in the countryside. You can get decent gulyás outside of Budapest with relative ease. 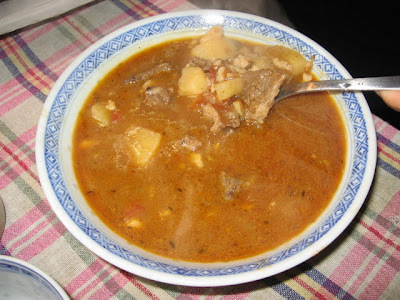 Basically, gulyás is a beef soup with potatos, paprika, and maybe, depending on the regional style, a smattering of flour and egg pinched dumplings. Easy, right? Well, it used to be that you coulod get a good bowl almost everywhere... I mean, this is hungary, right? Wrong. For one thing, beef quality took a nosedive after 1990 when the old communist collectivized beef farms - ranches, really - were sold off to smaller ownerships. Good beef production needs a large ranch or feed lot operation to operate, and as the State owned collectives were auctioned off most owners bought smaller lots and switched to raising dairy cows on a smaller, family scale operations. The result: stringy, tough dairy cow meat instead of the traditional quality beef that Hungary used to be famous for. Another reseaon is the training that Hungarian restaurant chefs get at the primary level. Everybody is still trained in state chef schools that turn out ready made kitchen staff, and everybody cooks pretty much the same. 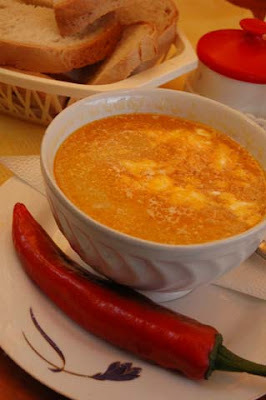 When I used to work at the Csiga as a pub chef, I made an attempt to make the best gulyás soup in Budapest. (Pictured above, in my home style version.) 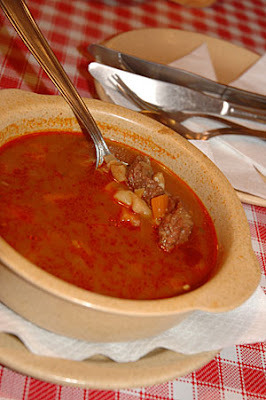 Every afternoon I would query the old timers who sat at the bar about what makes a good gulyás. Good beef. Onion, potato, paprika, mayorana, pepper, and egg-flour csipetke dumplings (hey - we are all from west Hungary around here...) No carrots, celery, or flour thickeners. To start I used to get a whole cow spine from the butchers to use for stock. The wait staff, however, were appalled that my gulyás didn't follow the state guidelines for gulyás (a miserly eight deka of meat per serving, made up for by the addition of - horrors! - carrots.) It was a damn good gulyás, mind you, and not technically illegal. The problem was that if you serve a good, honest portion of gulyás soup the Hungarian customers will probably not order anything else on the menu. And so it was. 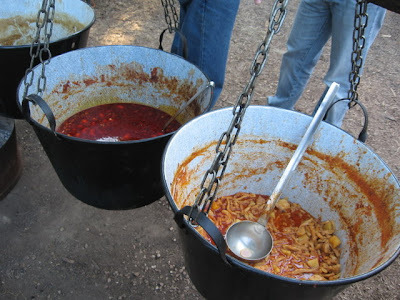 Until the gulyás sold out, nobody ordered anything else. After a while I gave up trying to impress my folks and just took them to the places I would normally eat. 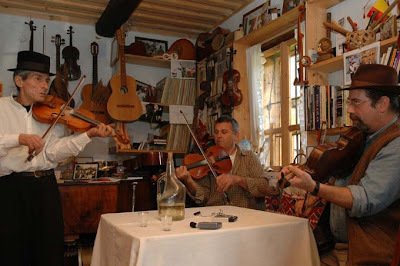 For gulyás leves, it was the Kafana, Chef Nenad Angelic' Serb restaurant on Molnar utca. 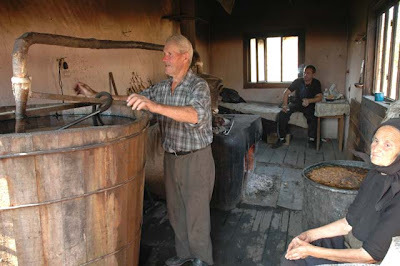 Nenad is from the Voivodina, which is a cultural extension of the Hungarian plains, and so for gulyás his may well be the best available in Pest. Just ignore the carrots. I promise that this is the last post I make about our trip to Italy. Been busy here in Budapest and haven't been out adventuring much... so just a batch of more photos from a couple of weeks ago. 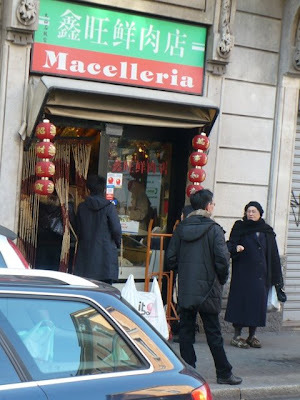 While we were in Milan we naturally gravitated to the Chinatown district, located along Via Sarpi northeast of the downtown. Italians and Chinese: two great tastes that go great together! How can you go wrong? Well, one way is to tell a Chinese driver to move his car. Last summer some cops did just that and sparked a weekend of riots throughout Milan's Chinatown. But things have calmed down, the Chinese are busy selling the clothing that fills many of Milan's cut rate boutiques, and hey, unlike many Chinatown districts, the Via Sarpi area actually melds both cultures - you have Chinese enjoying italian pastries and sipping coffees and Italians gorging on Shanghai dim sum. It's a win-win situation. 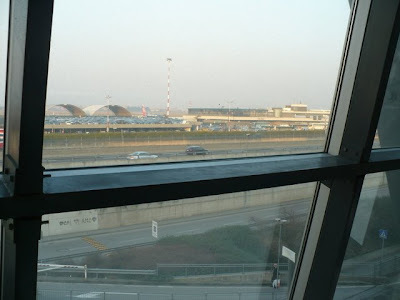 Since we had taken a cheap flight in Whizz Air to Milan (tickets cost 25 cents... plus airport taxes of about $40) we flew via Bergamo's airport. 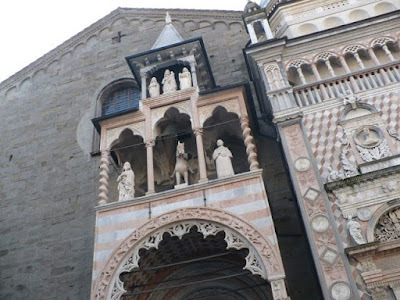 Bergamo is a beautiful town less than an hour east of Milan, divided into a busy lower city built on a plain, and a medieval upper town perched on a hillside. 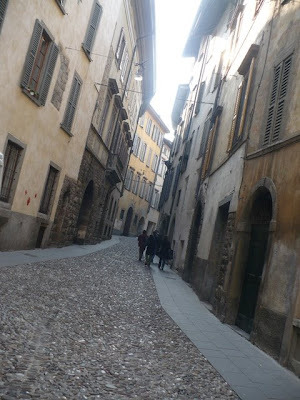 Bergamo is a great town to spend a day in - it's small scale allows you to get most of the sites in with a minimum of walking. The cathedral in the upper city was a relief after the monumental never-get-finished Duomo in Milan. Finally, a Duomo you can see without panoramic eyeglasses. The cuisine of Bergamo is essentially Alpine-Venetian, and polenta is served with virtually everything, including sweets. 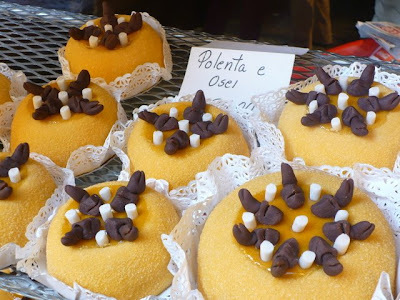 The local specialty is a polenta cake with little chocolate birds heads sticking out, "polenta of birds." Hmmm... johnny cake with chocolate. They would love these in Romania. Mamaliga balls with chocolate! 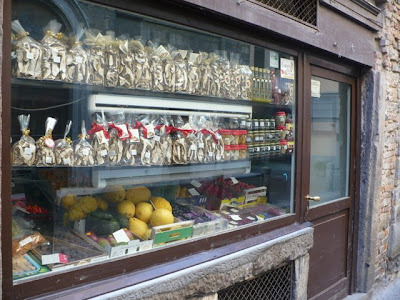 The bakeries offered both sweets and a selection of fresh pastas, as do most Italian bakeries. 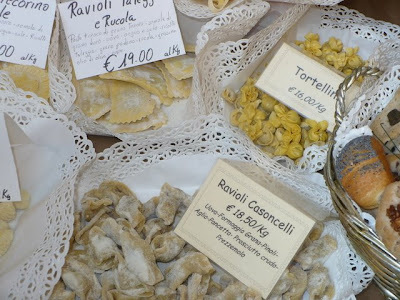 every region has a different version of stuffed fresh pasta - raviolis, tortellinis, you name it - and Bergamo is no different. But check this out: ravioli with rucola, EU 19 a kilo? As the Kangaroo says to the bartender in the famous joke "And at these prices you won't be seeing many more...." I think I would rather whip up a batch at home. On the other hand, a shop specializing in truffles and porcini mushrooms is something I wouldn't mind having in my neighborhood. 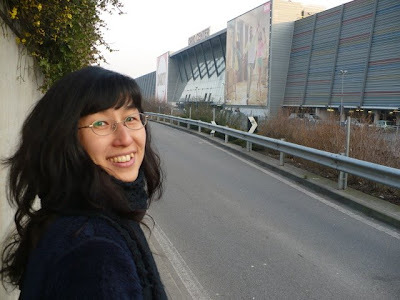 We had a day in Bergamo, before catching our flight back to Budapest we had to visit Italy's largest shopping center, the Orio Center located just across the highway from the Bergamo Airport. 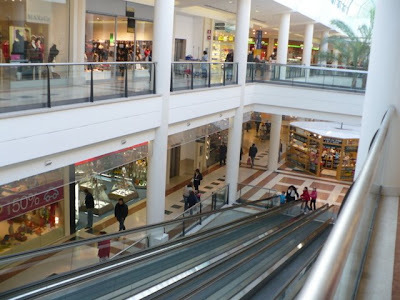 (Below: view from the Mall food court) A lot of English people fly to Bergamo just to go shopping at this monster and then catch the flight back to Old Blighty. Somehow, they don't make getting from the Airport to the Mall very easy - you have to walk along the highway for a kilometer before you get to an underpass tunnel, and then walk back along a highway to get top the mall. 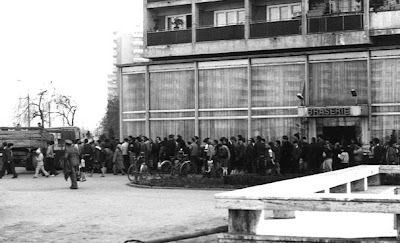 No problem... we'll crawl on hands and knees to go shopping at an Italian hypermarket any day! Now, when you go to a mall, you might get a bit hungry... so wander into the food court. 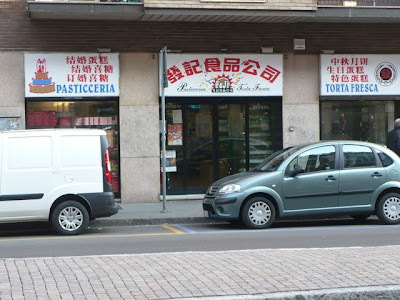 Yes, they had some desultory chinese buffet place, but everything else was Italian. Excellent Italian. 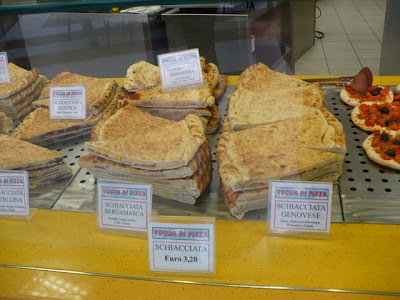 Pizza to die for, stuffed double crust pizzas (seen below,) calzones, panini, piadinas... This is the food court di tutti food courts. And then there is the Iper supermarket. God shops here. Yes, that's right. He shops here. We know this for a fact, and it is not nice to argue about religion, so just take my word for it. God shops here. OK? So we decided to shop here too. 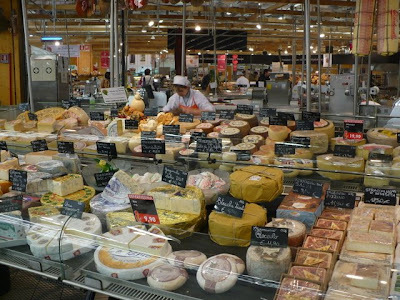 The cheese selection at the Bergamo Iper market. 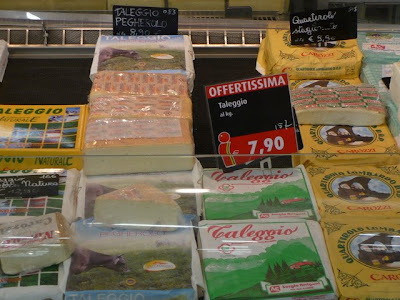 This is an entire selection of Talleggio cheese on sale, as opposed to those not on sale. If you like the sharp, creamy taste of Talleggio, it makes sense to shop in a place where six or seven of them are "on sale" at all time, no? 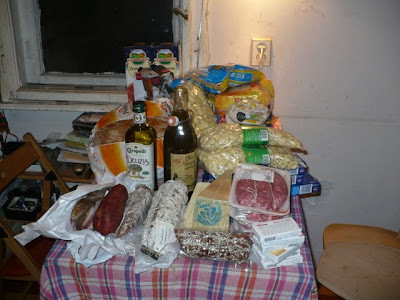 Every time we visit Italy we tend to stock up on groceries, and this time we stuffed a duffle bag full of food, checked it in as luggage, and brought it all home to Budapest. Several Bergamo salamis, a king's ransome of pasta, a river of good olive oil, and a couple of zampones to cook up for our friends back in Budapest. Here's the haul after we got home... We had promised our friends a feast when we got home, so we met at the home port of Captain Squid and Mdme. Squidella La Lignje to cook up zampone with lentils. 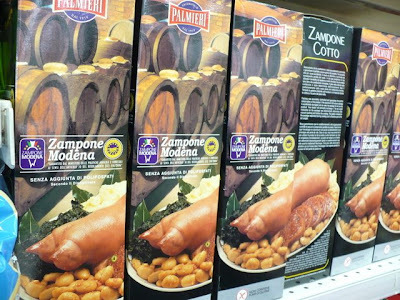 Zampone are pigs feet stuffed with cotechino sausage, and are a specialty of Modena. Usually they take hours to cook, but these babies are the heat and serve variety produced by one of Modena's most respected families of zampone producers. Yes, its a pig's foot. A very tasty pig's foot. It is almost guaranteed to make an American scream "Ewwww! Icky!" Hmmmm.... pork! Yes, once again, I have avoided any Jewish content in this blog to bring evidence of the superiority of non-kosher food products deriving from Ancient civilizations! A mere half hour of boil in the bag porky goodness and here you go! We served it on a bed of lentils, which symbolize wealth and traditionally eaten with zampone or sausages (in this case, both) at New Years. These people are eating their weight in pork as we watch. This type of gluttony is what medieval priests were talking about when they made eating too much a sin. Is everybody happy?